Why did the traveler cross the road? To satisfy her wanderlust, of course! If that is even possible. I have barely been off the North American continent, the furthest travel spots being Mexico and Hawaii. But I am willing to pack for any kind of adventure! 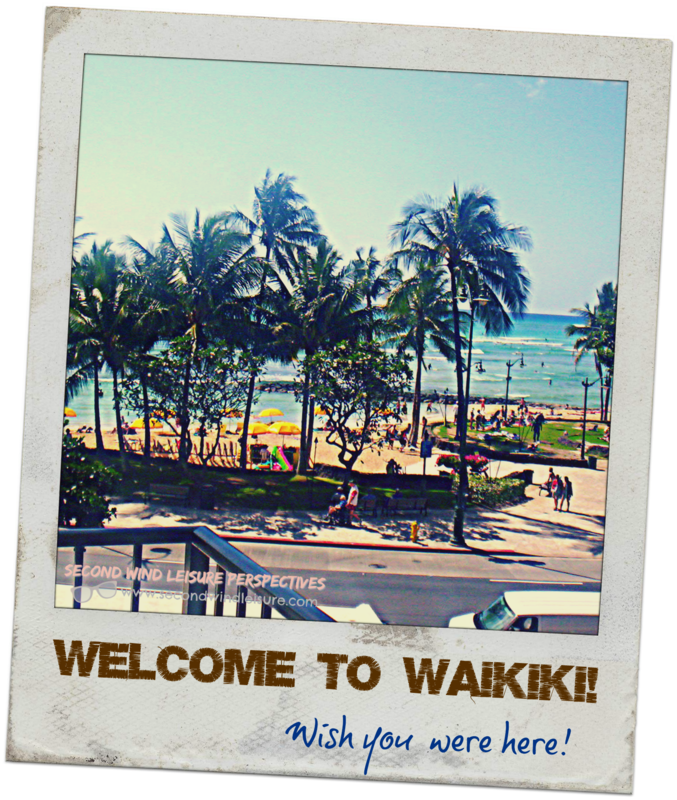 Referring to the “Polaroid” above, it has been over 10 years since I visited Hawaii and stayed on Waikiki Beach. That was the view from our balcony. Not a fancy place, but who hangs out in a hotel room all day? In 2010, I flew solo to Baja, Mexico by way of Guadalajara. I almost didn’t make the hopper that took us to Baja. 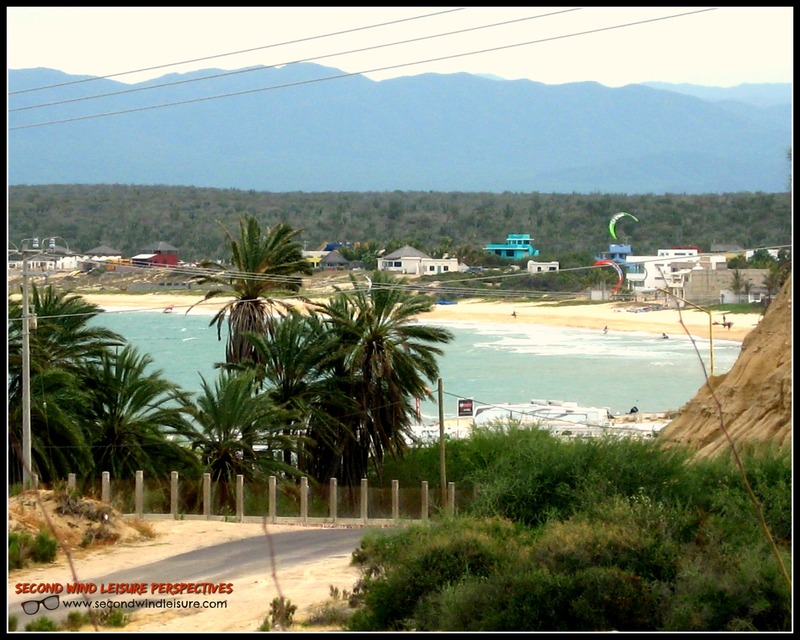 From this view you can look down into La Ventana Bay which is home to several resorts that cater to windsurfing, kite-boarding and all things water-sport! My hubby (then boyfriend) was already camped there. He had driven in his truck over 1200 miles from Northern California. This is a popular winter spot for wind-sport enthusiasts to get some warm sunshine between November and February. This week’s photo challenge asks us to share our visions of Wanderlust. Here are a few places I have been. Morning glow on I-5 near Mt Shasta California. My beach chair view after a long windsurf session, in Baja, Mexico. I am hoping to visit Hawaii or Mexico in January. My hubby and I are making plans to visit Europe in a few years. The road is open! Where has the road taken you? Seeing your pictures I really wished I was there … Thank you! Oooo – I love the way that you have (gorgeous) pictures as links to your previous adventure posts. Baja, Mt Hood, Lake Tahoe and Yosemite are all on my bucket list thanks to you. You’ve captured them beautifully. Tough decision whether to travel to Mexico or Hawaii next. Can’t go wrong with either. And I would love to see you photographing in Europe. Perhaps we will get lucky and you will add SE Asia to your travel list :). Thanks, Lisa! Looks like Hawaii is first choice. I would love to visit SE Asia!! I will text you when I get to the UK, lol! My goodness, this post is wonderful! My wandering heart is always yearning to go…. mainly into the wilderness and as high up on mountains as possible but there’s literally a whole world of possibilities!! Thanks for sharing! Thank you! I was following you at one point and saw that I wasn’t, so very nice to reconnect! Thanks for reconnecting! I look forward to reading more of your posts! wonderful pictures, Terri. Wanderlust could become contagious.!! They look like such fabulous places, Terri – North America has an incredible diversity of things to see. I’m looking forward to hearing more about your travels. Thanks, Toni, and I want to visit Australia and new Zealand! I sure hope so, Terri! Luckily you live in California where there is a lot you see. Beautiful pictures, Terri. Wanderlust could become contagious. Yet…that is the operative word!! I hope you are able to fulfill your lust for travel! Being retired has made it so easy to just GO! No putting in for time off or making sure your works gets handled when you are out of the office. It will get there, Hans still work, but with my summers off , I can run to San Diego for a week if needed. The road takes me everywhere! So glad you are venturing forth and your photos are gorgeous! Looking forward to seeing them as you travel. Wonderful photos, Terri. I love your sense of adventure and your ‘open road’. I look forward to reading about your upcoming travels!